Shakespeare lovers, it’s that time of year again—time to celebrate the Bard at Rock Ledge Ranch Historic Site as part of Theatreworks’ annual Summer Shakespeare tradition. This year, Theatreworks is expanding the repertoire to include two plays: the classic “Macbeth,” and the more contemporary “Complete Works of William Shakespeare [Abridged].” Theatreworks staff sat down with Macbeth director Jeff Flygare to gain some insight on his creative vision. Theatreworks: Macbeth is one of Shakespeare’s most well-known plays, and for good reason. What makes it so captivating? Jeff Flygare: Macbeth is a play for all time; its resonances vary with the moment in which it is produced. The protagonist of this play fascinates me because audiences should hate him; he is a mass murderer, who knowingly commits evil. Yet we are drawn to him, fascinated by his inability to resist what he knows is wrong. That makes him like each of us. Macbeth crosses a line most of us never cross, but all of us are tempted to cross. Why? How little it takes to move beyond that line, and what an incredible cost if we do. Our production will examine the psychological tension of deciding to cross that line, and the emotional results of that journey. The production will play with the liminal line between dream and reality, so although it is set in modern times, it has strong implications from the past, and thus will suggest its relevance to any time period. The nature of what is true and what is imagined is an important issue in the play, and that is another theme that makes it relevant for our times. Political intrigue, issues of loyalty and the shifting nature of loyalty in the political court also make it relevant. TWK: You’ve been involved with Theatreworks for over 30 years, first as an actor, then as Murray’s assistant director for more than a dozen Shakespeare productions since 1992. Can you tell us a little bit more about this collaboration? Jeff: I met Murray in 1982 when I auditioned for a production of “Richard III.” I was cast in that show and I continued to do summer Shakespeare with him through the 1980s, playing parts in The “Comedy of Errors,” “The Merchant of Venice,” “The Tempest,” “The Taming of the Shrew,” “Othello” and “Hamlet.” I got to know Murray and his wife Betty through that decade and we became good friends. In 1987 I was thinking about shifting careers, and with Murray and Betty’s good advice decided to become a high school English teacher. That led to what would eventually be a 26-year career as a teacher, and to directing high school productions, seventeen over the 26 year period, about half of them Shakespeare. At any rate, in 1992 I went to Murray and asked if I could be his assistant director on that summer’s production of “Winter’s Tale” and he said yes. The rest you know – lots of co-productions, including the 2002 “King Lear” with Bob Pinney. TWK: Murray was, by all accounts, a Shakespeare enthusiast. How do the summer Shakespeare productions illustrate his passion, and how do they help make Shakespeare accessible? Jeff: The summer Shakespeare production was Murray’s “baby”, and although he didn’t direct every single year, he did most of them. In founding Theatreworks, he brought a deep belief in the power of theatre to affect and inspire audiences, and he felt theatre should not be limited to classical or contemporary, but should be eclectic, and should combine the best of all eras. Of course, it’s hard to beat Shakespeare as a writer! Murray felt that Shakespeare should be accessible to audiences at any level, particularly every socio-economic level, and therefore the summer Shakespeare productions started as freebies – just come and sit and watch Shakespeare. He rapidly found out that such an idea, though ideal, isn’t sustainable. Through the late 80s and into the early 90s, corporate sponsorship for the summer Shakespeare production dried up. Gradually Theatreworks moved towards ticket sales covering the costs, and for many years we offered a few free tickets on a first-come basis. Now the tickets are virtually all sold, and the summer Shakespeare production is very profitable most years, and helps support other parts of our season. We’re determined to continue his legacy of high-quality Shakespeare productions available at reasonable cost to anyone. In taking on this production, I intend to honor his ideas in that way. Also, I intend to approach Shakespeare the way he taught me to do it. Deep and thorough attention to the text, but not allowing the text to dominate. Further, he believed actors need to primarily do two things in bringing Shakespeare on to an American stage. First, we must make this “foreign” language available to the audience. We know that if we go out on stage and say every word clearly, and the audience hears every word, they will understand about 60% of what is being said. Therefore, it is our responsibility to thoroughly understand what the text is saying and find a way, to the greatest extent we can, to bring that to our audience. Secondly, the actor has the primary responsiblity to “tell the story” – make sure the audience understands what is going on, and take them with us through the play. With Shakespeare, those are two very hard tasks. And the amazing thing (and I am still continually amazed by this even though I have watched it happen for over 35 years) is that we will go from first encounter with the Shakespearean text to opening night in about 24 calendar days. It is an intense, wild rehearsal schedule, but I will be doing it the way Murray taught me – collaboratively, with the ideas of all the artists in the rehearsal hall brought into the mix to create the magic. Doing it that way, in a short time, is risky, and once in a while it doesn’t completely work. But when it does work, it creates magic! TWK: Your production of Macbeth is set in the present day. Can you expand on this choice? Jeff: When a director comes to choosing a vision for a production, there are many factors to consider. At a thematic level, one asks whether the play can be pushed into the contemporary world or not. With Shakespeare, there are very few of his plays (frankly, I am hard-pressed to identify one) that don’t work in a modern setting. The question is, why do that? Because Shakespeare understood humanity at a level no other writer even comes close to (although he’s not a playwright, the only other writer I would even remotely say comes close is James Joyce), his works speak to any time period. Further, a director considers whether the themes of the play are relevant to contemporary times. It is clear that some of the themes of Macbeth are very relevant. Of course, the danger is that you push that too hard, beating the audience over the head with the connections. (I had a silly idea early on, of having Malcolm do his closing speech in a blond wig with a comb forward as Trump suggesting he would “make Scotland great again’, which is way over the top. I threw it away almost at the moment I thought of it). In the end you offer the themes, and ask the audience to make the connections. But these aren’t the only considerations. What have other acting companies done with Macbeth recently? I looked online and found that in the last three years about 60% of the productions in the US of Macbeth used a “period” setting – roughly 11th century. The fact is, the old, medieval setting has been done to death. I thought we could certainly use something a bit more original. But I didn’t want to just say it was 2018 and call it done. I wanted to “cheat” – and part of that was simply practical. If we set it solely in 2018, the weapons would be assault rifles and pistols. I didn’t want to lose the sword play late in the play, and so we cross many barriers of time, back and forth, so the audience, although they assume we are in 2018, doesn’t fully feel limited by that date. 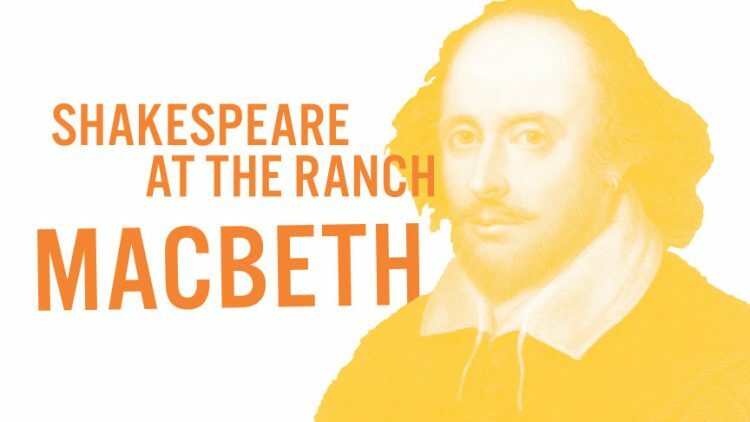 Shakespeare at the Ranch will run from July 26 through August 26. Pop-up performances from the Theatreworks summer camp students will add to the festival fun. For tickets to Macbeth, click here. For tickets to The Complete Works of William Shakespeare (Abridged), click here. –This Q&A was originally posted by UCCS Presents June 28, 2018.